The Titan IV family (including the IVA and IVB) of rockets were used by the U.S. Air Force. They were launched from Cape Canaveral Air Force Station, Florida, and Vandenberg Air Force Base, California. At the time of its introduction, the Titan IV was the "largest unmanned space booster used by the Air Force." As originally conceived in the mid-1980s, the Titan IV was only intended to complement the space shuttle and fly a mere ten times. However, the Challenger Disaster in 1986 caused a renewed dependence on expendable launch systems so that the program was significantly expanded. Under the original plan, the Titan IV would only be paired with Centaur stages and fly exclusively from LC-41 at Cape Canaveral. The post-Challenger program also involved flying IUS (Inertial Upper Stage) or even no upper stages. LC-40 at the Cape was also converted for Titan IV. Even with the reduced schedule, almost forty Titan IVs were scheduled as of 1991 and a new, improved SRM (solid rocket motor) casing using lightweight composite materials was introduced. The Titan IV was the last of the Titan family of rockets. It was retired in 2005 due to its high cost of operation. The final launch (B-30) from Cape Canaveral AFS occurred on April 29, 2005, and the final launch from Vandenberg AFB occurred on October 19, 2005. Lockheed Martin Space Systems built the Titan IVs near Denver, Colorado, under contract to the government. The Titan IV is currently on display at Evergreen Air and Space Museum in McMinnville, Oregon. The Titan IV was developed to provide assured capability to launch Space Shuttle–class payloads for the Air Force. The Titan IV could be launched with no upper stage, or either of two upper stages, the IUS (Inertial Upper Stage), and the Centaur rocket upper stage. The Titan IV was made up of two large solid-fuel rocket boosters and a two-stage liquid-fueled core. The two storable liquid fuel core stages used Aerozine 50 fuel and nitrogen tetroxide oxidizer. These propellants are hypergolic (ignite on contact) and are liquids at room temperature, so no tank insulation is needed. This allows the launcher to be stored in a ready state for extended periods. Both propellants are extremely toxic. The Titan IV could be launched from either coast: SLC-40 or 41 at Cape Canaveral Air Force Station near Cocoa Beach, Florida and at SLC-4E, at Vandenberg Air Force Base launch sites 55 miles northwest of Santa Barbara California. Choice of launch site depended on mission parameters and mission goals. The IV A (40nA) used boosters with steel casings, the IV B (40nB) used boosters with composite casings (the SRMU). Type 403 was no upper stage, for lower-mass payloads to higher orbits from Vandenburg. Type 404 was no upper stage, for heavier payloads to low orbits, from Vandenburg. Type 405 was no upper stage, for lower-mass payloads to higher-orbit from Cape Canaveral. Interactive 3D model of the Titan IV, fully assembled (left) and in exploded view (right). The Titan rocket family was established in October 1955 when the Air Force awarded the Glenn L. Martin Company (later Martin-Marietta, now part of Lockheed Martin) a contract to build an intercontinental ballistic missile (SM-68). It became known as the Titan I, the nation's first two-stage ICBM, and complemented the Atlas ICBM as the second underground, vertically stored, silo-based ICBM. Both stages of the Titan I used liquid oxygen and RP-1 as propellants. A subsequent version of the Titan family, the Titan II, was similar to the Titan I, but was much more powerful. Designated as LGM-25C, the Titan II was the largest missile developed for the USAF at that time. The Titan II had newly developed engines which used Aerozine 50 and nitrogen tetroxide as fuel and oxidizer in a self-igniting, hypergolic propellant combination, therefore allowing the Titan II to be stored underground ready to launch. Titan III development began in 1964 with the Titan IIIA. Years later[when? ], the Titan IVB evolved from the Titan III family and is similar to the Titan 34D. While the launcher family had an extremely good reliability record in its first two decades, this began to change in the 1980s with the loss of a Titan 34D in 1985 followed by the disastrous explosion of another in 1986 due to a SRM failure. The Titan IV-B vehicle was intended to use the new composite-casing SRMs manufactured by Alliant Technologies rather than the old steel-casing SRMs produced by Chemical Systems Division (Titan IV-A would use the CSD motors). However, there were numerous development problems with them and so Lockheed-Martin put out a request to CSD to supply a few more of the old-style SRMs. On August 2, 1993, Titan IV K-11 lifted from SLC-4E carrying a NOSS SIGNIT satellite. Unusual for DOD launches, the Air Force invited the civilian press to cover the launch and it became more of a story than intended when the booster exploded 101 seconds after liftoff. Investigation found that another SRM burn-through had occurred, albeit much higher up and later in the flight than 34D-9. This incident was found to have been caused by an improper repair job on one of the SRMS. After Titan 34D-9, extensive measures had been put in place to ensure proper SRM operating condition which included X-raying the motor segments during prelaunch checks. The SRMs that went onto K-11 had originally been shipped to Cape Canaveral where X-rays revealed anomalies in the solid propellant mixture in one segment. Repair work was done on it, but further X-rays were still enough for CC personnel to disqualify them from flight. The SRMs were then shipped to Vandenberg and approved. The repair work on the SRMs had involved workers making a pie-shaped cut in the propellant block to remove the defective area. However, most of CSD's qualified personnel had left the program by this point and so the repair crew in question did not know the proper procedure. After replacement, they neglected to seal the area where the cut in the propellant block had been made. The result was a near-repeat of 34D-9; a gap was left between the propellant and SRM casing so that another burn-through occurred during launch. In October 1997, a Titan IV-B rocket launched Cassini–Huygens, a pair of probes sent to Saturn. 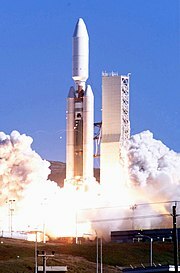 It was the only use of a Titan IV for a non-Department of Defense launch. Huygens landed on Titan on January 14, 2005. Cassini remained in orbit around Saturn. The Cassini Mission ended on September 15, 2017 as it was manoeuvered into Saturn's atmosphere to burn up. 1998 saw the worst accident when a launch of a Navy ELINT Mercury (satellite) from Cape Canaveral failed around 40 seconds into the flight. An electrical failure caused the Titan to suddenly pitch downward, the resulting aerodynamic stress causing one of the SRMs to separate. The ISDS (Inadvertent Separation Destruct System) automatically triggered, rupturing the SRM and taking the rest of the launch vehicle with it. At T+45 seconds, the Range Safety Officer sent the destruct command to ensure any remaining large pieces of the booster were broken up. Investigation showed that Titan K-17, which was several years old and the last Titan IV-A to be launched, had dozens of damaged or chafed wires and should never have been launched in that operating condition, however the Air Force put extreme pressure on launch crews to meet program deadlines. The ultimate cause of the failure was an electrical short that caused a momentary power dropout to the guidance computer at T+39 seconds. After power was restored, the computer sent a spurious pitch down and yaw to the right command. At T+40 seconds, the Titan was travelling at near supersonic speed and could not handle this action without suffering a structural failure. In any case, the Titan's fuselage was filled with numerous sharp metal protrusions that made it nearly impossible to install, adjust, or remove wiring without it getting damaged. Quality control at Lockheed's Denver plant, where Titan vehicles were assembled, was described as "awful". An extensive recovery effort was launched, both to diagnose the cause of the accident and recover debris from the classified satellite. All of the debris from the Titan had impacted offshore, between three and five miles downrange, and at least 30% of the booster was recovered from the sea floor. Debris continued to wash ashore for days afterward, and the salvage operation continued until October 15. The Air Force had pushed for a "launch on demand" program for DOD payloads, something that was almost impossible to pull off especially given the lengthy preparation and processing time needed for a Titan IV launch (at least 60 days). General Chuck Horner, shortly before retiring in 1994, had referred to the Titan program as "a nightmare". The 1998-99 schedule had called for four launches in less than 12 months. The first of these was Titan K-25 on May 9, 1998 which successfully orbited an Orion SIGNIT satellite. The second was K-17, and the third, delayed thanks to the investigation around K-17's failure, was K-32 on April 9, 1999 which carried a DSP early warning satellite. The IUS second stage failed to separate, leaving the payload in a useless orbit. Investigation into this failure found that wiring harnesses in the IUS had been wrapped too tightly with electrical tape so that a plug failed to disconnect properly and prevented the two IUS stages from separating. The fourth launch was K-26 on April 30, which carried a Milstar communications satellite. During the Centaur's flight, an uncontrolled roll motion developed, causing the upper stage and payload rotate at ever-increasing rate. This threw the stage off course so when it came time for restart, the Centaur cartwheeled out of control and left its payload in a useless orbit. This failure was found to be the result of an incorrectly programmed equation in the guidance computer. The error caused the roll rate gyro data to be ignored by the flight computer, resulting in open-loop firing of the roll control thrusters until the RCS fuel was depleted. In 1988-89, The R. M. Parsons Company designed and built a full scale steel tower and deflector facility, which was used to test the Titan IV Solid Rocket Motor Upgrade (SRMU). The launch and the effect of the SRMU thrust force on the space shuttle vehicle were modeled. To evaluate the magnitude of the thrust force, the SRMU was connected to the steel tower through load measurement systems and launched in-place. It was the first full-scale test conducted to simulate the effects of the SRMU on the main space shuttle vehicle. In the early 1980s, General Dynamics conceived of using a Space Shuttle to lift a Lunar Module into orbit and then launch a Titan IV rocket with an Apollo-type Service Module to rendezvous and dock—making a moonship for a lunar landing. The plan required the Space Shuttle and Titan IV to use aluminium-lithium alloy fuel tanks instead of aluminum to make a greater payload weight for takeoff. The original plan never came to fruition, but in the 1990s the Shuttle was converted to aluminum-lithium tanks to rendezvous with the highly inclined orbit of the Russian Mir Space Station. The Titan family had become extremely expensive to fly by the 1990s and there were also growing safety concerns over its toxic propellants. The Atlas V rocket and the Delta IV and its heavy rocket booster variant launch vehicles were designed to replace the Titan IVs. The next-generation ELVs such as Delta IV would use only solid motors and cryogenic propellants, as well they would be completely new, modern designs not derived from a 1960s missile system. In 2014, the National Museum of the United States Air Force in Dayton, Ohio, began a project to restore a Titan IV-B rocket. This effort was successful, and on June 8, 2016 its display was opened. The only other surviving Titan IV core is on outdoor display at the Evergreen Aviation and Space Museum, to include the stages and parts of the solid rocket motor assembly. Stage 0 consisted of two solid-rocket motors. Stage 1 used an LR87-AJ-11 liquid-propellant rocket engine. Stage 2 used the LR91-AJ-11 liquid-propellant engine. Optional upper stages included the Centaur and Inertial Upper Stage. Guidance System: A ring laser gyro guidance system manufactured by Honeywell. Stage 0: Solid rocket motors provide 1.7 million pounds force (7.56 MN) per motor at liftoff. Stage 2: LR91-AJ-11 provides an average of 105,000 pounds force (467 kN). Optional Centaur (RL10A-3-3A) upper stage provides 33,100 pounds force (147 kN) and the Inertial Upper Stage provides up to 41,500 pounds force (185 kN). and up to 38,800 pounds (17,600 kg) into a low Earth polar orbit when launched from Vandenberg AFB. Cost: Approximately $250–350 million, depending on launch configuration. Launch sites: Cape Canaveral AFS, Fla., and Vandenberg AFB, Calif. In 1990, the Titan IV Selected Acquisition Report estimated the total cost for the acquisition of 65 Titan IV vehicles over a period of 16 years to US$18.3 billion (inflation-adjusted US$ 35.1 billion in 2019). SLDCOM Failure SRM exploded at T+101s due to damage caused during maintenance on ground. 11:30 CCAFS LC-41 A-20 401A / Centaur NROL-7 (Mercury) Failure Guidance system short-circuited at T+40s due to frayed wire, vehicle lost control and destroyed by range safety. 17:01 CCAFS LC-41 B-27 402B / IUS USA-142 (DSP-19) Failure Spacecraft failed to separate from IUS stage. 16:30 CCAFS LC-40 B-32 401B / Centaur USA-143 (Milstar-3) Failure Centaur software database error caused loss of attitude control, insertion burns done incorrectly. Satellite deployed into useless orbit. ^ a b "Lockheed Martin's Last Titan IV Successfully Delivers National Security Payload to Space". October 19, 2005. Archived from the original on January 14, 2008. ^ "Space and Missile System Center Mission and Organization" (PDF). Space and Missile Systems Center's History Office. Retrieved September 20, 2008. ^ "Titan 4B and Cape Canaveral". ^ "Spaceflight Now - Titan Launch Report - Titan 4 rocket expected to launch Lacrosse spy satellite". ^ "Titan IV". USAF Air University. 1996. ^ Nemiroff, R.; Bonnell, J., eds. (27 October 2005). "The Last Titan". Astronomy Picture of the Day. NASA. Retrieved 2008-09-20. ^ "National Museum of the U.S. Air Force fourth building now open". ^ Michael Timothy Dunn (Dec 1992). "Analysis of Titan IV launch responsiveness" (PDF). Air Force Institute of Technology. Retrieved 2011-07-08. ^ Kingsbury, Nancy R. (September 1991). "TITAN IV LAUNCH VEHICLE --- Restructured Program Could Reduce Fiscal Year 1992 Funding Needs" (PDF). US General Accounting Office. Wikimedia Commons has media related to Titan IV 4B-33.